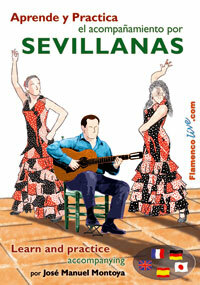 This DVD provides explanation of the strumming techniques, the timing and rhythmic cycle of the Sevillanas. All at two possible speeds (slow and normal), along with practical exercises. At slow speed the voice is replaced by a flute. A wide repertoire of Sevillanas is performed in the most common keys. At all stages the sound of the guitar can be muted so that you can practice accompanying the group (singing, clapping and percussion). Includes music notation (cifra and solfa) of all the exercises and Sevillanas played. 5 languages: Spanish, English, French, German and Japanese. Includes score booklet (56 pages). DVD full compatible with all countries (PAL and NTSC).